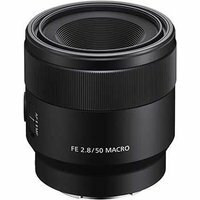 The lightweight, compact Sony FE 50mm f2.8 Macro lens is a versatile E-mount prime suitable for photographers and videographers looking for a fast, full-frame prime with macro functionality. With its wide f2.8 maximum aperture, 1:1 macro capability and a field of vision close to the human eye, the lens is great for close-up work and everyday photography, such as travel, portraits, scenery, and shooting in low-light. Its circular 7-blade aperture design delivers beautiful bokeh (defocus) effects.